A buck can lose up to 25% of his body weight during the rut and in the winter when food is scarce. By the time spring rolls around and he is starting to grow new antlers, he is also having to replace lost weight. You don’t want all the nutrients he consumes in the spring to be spent making up for last year’s weight losses’. Because Winter-Greens is a highly nutritious late season food source, you can help reduce weight loss in your deer. And best of all, testing across North America has proven deer prefer Winter-Greens 4 to 1 over other brassica products tested. Winter-Greens is an annual blend of cold-season brassicas specifically designed for late-season food plots and late-season hunting. Winter-Greens is highly drought-resistant, able to withstand extremely cold temperatures and stands tall even under snow so that deer will find it when everything else is either dead or buried. And you can be sure they will find it. Deer love the taste of Winter-Greens, and you’ll love knowing they have a good source of nutrition during the winter – and best of all, they’ll come looking for it on your property. Winter-Greens is designed to be planted in late summer or fall. Some plot plantings become less attractive with cold weather and hard frosts. Others may not lose their allure but, when buried in snow, they require more effort than the deer are willing to expend, especially if there are alternative food sources that require less effort. The Whitetail Institute’s late-season food plot product, Winter-Greens, is the answer to these winter problems. A brassica blend, Winter-Greens is designed specifically to attract deer in late season. Winter-Greens is the most effective late-season food plot product you can plant. Brassicas by nature actually sweeten with a hard frost. To be precise, the first hard frost triggers plant maturity, which in turn results in a sweeter taste. It is recommended to plant Imperial Whitetail Winter Green Brassicas at least 50 days before the first fall frost in your area. 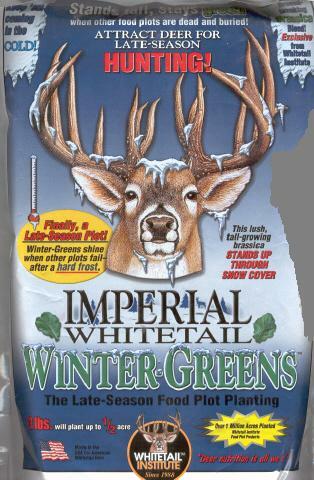 Imperial Whitetail Winter Greens is a nutritous, highly palatable brassica blend. This seed is planted cover very lightly, 1/4 inch or less, or leave un-covered, full detailed instructions are on the bag. A 3 lb bag plants 1/2 acre of succulent forage greens..